Everyone has heard about Mine Craft, and if you are an UNSCHOOLER you have probably played it more than once. Ok, if you are older than eight and homeschooled, you are probably addicted to the game and have had many conversations with your parents asking if you were going to do anything else today. 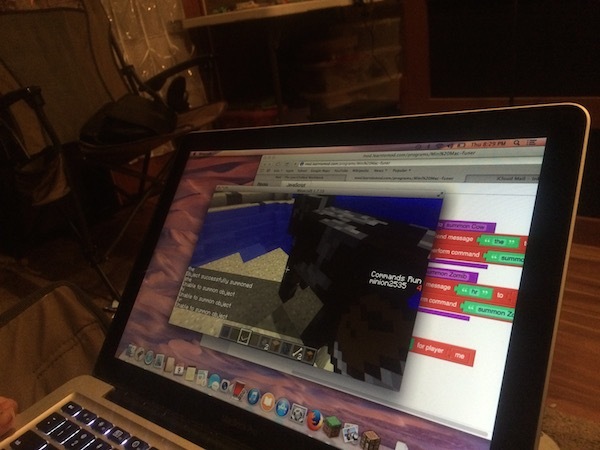 So the question is: Is it ok if your child plays Mine Craft all day, every day? The answer you keep reading over and over again is YES! I actually have to agree with them here and encourage my two kids to play this amazing game. I think it is such a great idea, I bought the beta version (helping programmers find bugs) on Learn To Mod and so the girls could learn programming. So why else am I encouraging the kids to play Mine Craft for hours and hours? They are learning Java or block programing which is just like playing Scratch.Their mentor or teacher gives girls an assignment, shows them a new programming skill, then they have to complete a mod (program function that does something in Mine Craft). They are practicing their reading, following directions, learning a new programming skill, corresponding through email with their mentor, and trying different problems till they get it right. Don’t forget that Mine Craft is full of math, geometry, architecture, depth perspective, creativity, and so much more. What amazes me is that this little block program that is so simple can teach a child so much. I say let your kids play and play as much as they want. You never know they might be the next Markus Persson, Steve Jobs or Mark Zuckerburg. This entry was posted in Computer skills/programming, Math, Reading/Language Arts, science, Unschooling and tagged architecture, creativity, depth perspective, following directions, geometry, learn to mod, Math, programming, reading by Chrissie. Bookmark the permalink.